Bach's St Matthew Passion is a monument in music history. Every year it is performed around the globe and especially during Passiontide. In the Netherlands where I live it is a kind of ritual to attend a performance of this work every year. It is hard to imagine that before the St Matthew Passion reached this status another work was just as popular - at least in Germany - as Bach's oratorio is today: Der Tod Jesu by Carl Heinrich Graun. Although he was first and foremost active as a composer of music for the stage it is this work that cemented his reputation. It was first performed on Good Friday in 1755, and was repeated the next year. This became a tradition, which lasted until 1884. Graun was educated as a singer, first in the capacity as an alumnus of the Kreuzschule in Dresden where he was trained as a choirboy. After his voice broke he studied keyboard and composition, but he also developed his singing voice, which allowed him to sing as a tenor in the court chapel of Braunschweig from 1725 on. Some years later he became vice-Kapellmeister there, due to his development as a composer. In 1741 Frederick the Great of Prussia appointed him as Kapellmeister of his court. He became the central figure in what is known as the 'Berlin school', which included Graun's elder brother Johann Gottlieb and composers like Kirnberger, Quantz, Benda and Carl Philipp Emanuel Bach. He also got the task to set up an opera house in Berlin. It was there that Der Tod Jesu was first performed. This work is not comparable to Bach's Passions. Those were written for liturgical use and based on one of the gospels. In 1712 Barthold Heinrich Brockes published Der für die Sünden der Welt gemarterte und sterbende Jesus, a mixture of paraphrase of and meditation on the Passion story. Brockes' libretto - generally known as the Brockes Passion - soon gained great popularity. Reinhard Keiser was the first who set it to music; he was followed by Handel, Mattheson, Stölzel, Fasch and several others. Such oratorios were not written for the church but intended for performances during public concerts, for a paying audience. 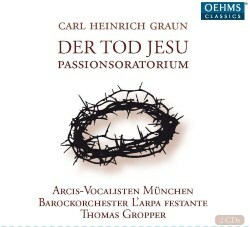 Der Tod Jesu is comparable with the Brockes Passion. The libretto was from the pen of the poet Carl Wilhelm Ramler, an important representative of the German Enlightenment. He wrote it at the request of the Princess Anna Amalia, sister of Frederick the Great. Graun and Telemann both set this libretto to music; both settings were performed in 1755. During the compositional process Graun and Telemann corresponded about technical matters and would later perform each other's work. In Der Tod Jesu Ramler paraphrases the description in the gospels, for instance the arrest of Jesus: "Now arms clash, spears gleam in the light of torches, and murderers invade. I see murderers: ah! he is doomed! Yet he without fear approaches the foe; magnanimously he speaks" and so on. One could argue that this oratorio is not dramatic. That is to say: there are no dialogues and the characters from the Passion story don't play any role. Some are mentioned: Peter and Caiaphas, but Pilate is only referred to as "the tyrant judge" and Judas is just one of "the foe". However, Der Tod Jesu certainly has dramatic traits: the drama is in the description of the events in the recitatives. The character of the arias is various. The first is addressed to Jesus: "Thou hero, upon whom the quiver of death is emptied, thou hearest him, the weak one". The third includes a moral appeal to unrepentant sinners: "You tearless sinners, quake! One day among the roses repentance will lift up the serpent's crest". The duet in the second part is put into the mouth of Jesus: "Enemies who sadden me, see how much my heart loves you: my revenge is to pardon you". The main goal of this oratorio is to tempt the audience to follow the path of virtue by following Jesus' model. The second aria talks about the "temple of virtue" and the duet ends with the phrase: "Blessed is he who resembles Thee!". It fits into the tenor of the oratorio that Jesus is called "friend of man". Several recordings of this oratorio are available. Pál Németh recorded it in 1991 (Quintana/Harmonia mundi) and in 2004 Hyperion released a recording under the direction of Sigiswald Kuijken. I was not completely satisfied with either of them. That is different here. Monika Mauch takes most of the arias - three, to one each for tenor and bass - and sings them very well. The arias are operatic in character but the interpreter should not exaggerate the operatic traits. Mauch finds exactly the right approach. She does not have the most dramatic of voices and that is just as well. 'Singt dem göttlichen Propheten' in the second part is particularly nice. Georg Poplutz's voice has some sharp edges and he uses them well in the recitative 'Nun klingen Waffen' and the ensuing aria 'Ihr weichgeschaffnen Seelen' in which the contrast between the two sections comes across effectively. Andreas Burkhart is impressive in the most dramatic recitative 'Jerusalem voll Mordlust' which includes the infamous exclamations of the Jewish people: "Let His blood be upon us, and upon our sons and daughters". He also makes the most of the aria with words like "thunderstorms" and "lightning". The duet is originally scored for two sopranos and that how it is performed in Kuijken's recording. In his liner-notes Thomas Gropper states that it "is usually performed today by soprano and tenor". That's not much of an argument to do the same. It's pretty much the only blot on this production, in addition to the fact that the text comes only in German. If you want to have an English translation you can download the booklet to Kuijken's recording from the Hyperion website. The quotations in this review are taken from that translation. The choir is not specified in the booklet, and therefore I don't know how many singers are involved. It sounds fairly large, but whether that corresponds to the forces used in Graun's time is impossible to say. The singing is fine and despite the choir's size the text is clearly audible. Much attention has been given to the text in the chorales. The orchestra delivers an important contribution to the impact of this performance. If you don't have this work in your collection this is the best version to go for.